Kakadu is a timeless place – beautiful and diverse beyond belief. It’s home to more than 2,000 plant species and some of the most charismatic animals around. Within the vast landscapes, there are six main landforms. These landforms are home to a range of plants and animals, endemic to Kakadu. Kakadu National Park supports an astonishing array of animals, and a number of which have adapted to particular habitats. A bushfire on 1 October destroyed more than 200 square kilometres of bushland in this world heritage national park. 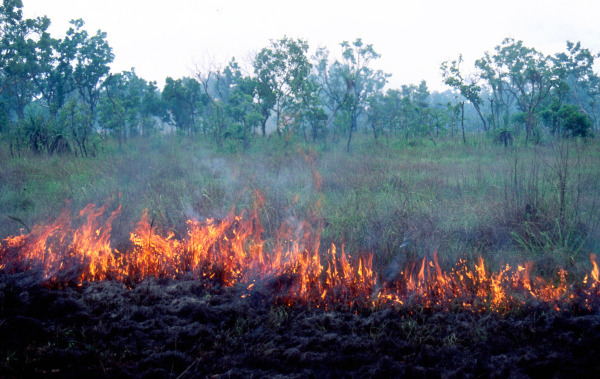 The federal environment minister, Greg Hunt, has ordered an investigation into a week-long bushfire in Kakadu national park sparked after a mining company lost control of a “controlled burn” – a contradiction in terms! “Minister Hunt has asked the Department and Parks Australia to conduct a full and thorough investigation into the cause of the fire,” a statement said. The fire threatened a number of culturally and historically significant sites. There was a change in wind after the burn had ended reignited embers and carried them across containment lines. “There’s no water in there, you can’t get suppression in there from the air, you can’t get boots on the ground in that country, it’s too rugged” he said. Traditional owners blamed the operators of the Ranger uranium mine, ERA, for lighting a fire too late in the top end’s dry season and losing control of it. ERA, majority owned by Rio Tinto, faces fines of up to $8.5m if it is found to have breached the environment protection and biodiversity conservation act. ERA has issued a statement saying it did not need approval to burn-off in its Ranger Project Area. Fire management is undertaken both by traditional owners and park staff, mostly in the early to mid-dry season period (typically May-July) when fires tend to be small, patchy, of low intensity and typically go out at night under cool, dewy conditions. Small mammal are in decline, due to fire regimes, characterised by frequent, extensive, late-season wildfires. Fire extent – an index incorporating fire size and fire frequency – was the best predictor of mammal declines, and was superior to the proportion of the surrounding area burnt and fire patchiness. Work in Kakadu National Park has shown that between 1996 and 2009 mammal populations crashed, with species richness and total abundance decreasing by 65% and 75% respectively. Prominent conservationist Tim Flannery asserts that “the main driver appears to be changes in fire regime, compounded by the presence of feral cats”. The breakdown of traditional Aboriginal fire management – and possible increase in the size and intensity of fires – is often suggested as a trigger. The Northern Land Council says the devastating fires in Kakadu over the past week, caused by poor fire management by Energy Resources of Australia. “The fires have also highlighted the pressing need for the Australian Government to reinstate traditional fire management practices delivered by Aboriginal people across the Park. Kakadu is listed for its environmental and cultural values and it’s time to deliver outcomes that deliver on its cultural values in addition to its environmental values” says NLC CEO, Joe Morrison. “Large parts of the park have burnt over 10 times in the past 14 years. We say there is a significant opportunity to reduce this fire frequency and reduce greenhouse gas emissions coming from the park,” Mr Morrison said. Petition: Save the Northern Quoll and 74 Other Endangered Species in Kakadu!